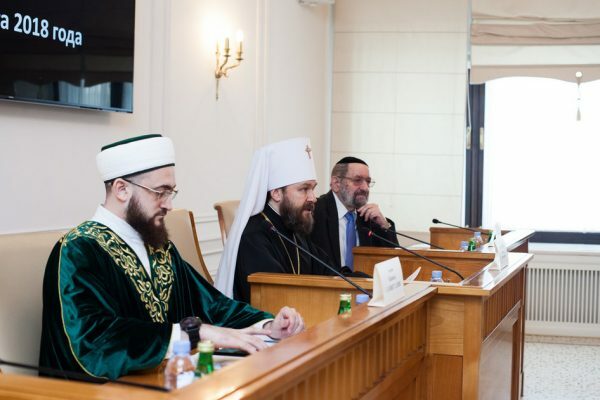 A regular meeting of the Interreligious Council of Russia (ICR) took place at the premises of the Ss Cyril and Methodius Theological Institute of Postgraduate Studies in Moscow on March 27, 2018. Among those taking part in the meeting were members of the ICR presidium Metropolitan Hilarion of Volokolamsk, chairman of the Moscow Patriarchate’s Department for External Church Relations (DECR); Mufti Kamil Samigullin, chairman of the Spiritual Administration of Muslims of the Republic of Tatarstan; chief rabbi of Russia Adolf Shayevich (Congress of Jewish Organizations and Associations of Russia) ; and Rev. Dimitry Safonov, ICR executive secretary and DECR secretary for interreligious relations. All the participants observed a minute of silence in tribute to the Kemerovo shopping mall victims. The first item of the agenda was a formation of the ICR regional branch offices in Tatarstan and in the North Caucasus with the aim to oppose extremism and terrorism and enhance interreligious cooperation. The DECR chairman underscored the importance of coordination of efforts of religious communities especially in the regions with an advanced threat of the extremists’ return. “We should learn to discover and neutralize Satanists thus preventing them from committing atrocities.” He added that comprehensive religious education was necessary to achieve this goal so that our citizens, competent in the teaching of traditional religions, will never succumb to the terrorist ideology disguised under a religious mask. The ICR members deem it necessary to propose the leaders of the Russian Federation to denounce the Wahhabi ideology as terrorist one and to define organizations preaching this ideology as terrorist organizations. The next item of the agenda was the problem of the state protection of religious buildings from terrorists. 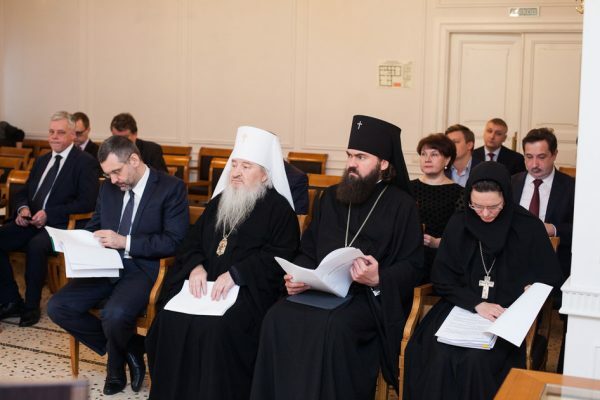 The Russian government adopted a Regulation on the protection of religious objects from the threat of terrorism in 2015; the implementation of the measures is under discussion, Metropolitan Hilarion said. The importance of cooperation of the Interreligious Council of Russia with the state structures aimed at the working out of recommendation for enhancing the level of protection of religious buildings with the interests of religious organizations taken into account was emphasized. The scientific and educational theological association was established in February 2018 as a voluntary association of the institutions of higher education with the aim to promote the development of theology as a branch of scientific knowledge. The participants welcomed the associati9on and participation in its work of the educational institutions of traditional religions. It was decided to hold the 2nd All-Russian scholarly conference “Theology in Humanities Education” next autumn and invite participants from abroad. Resolution was adopted at the end of the ICR meeting.